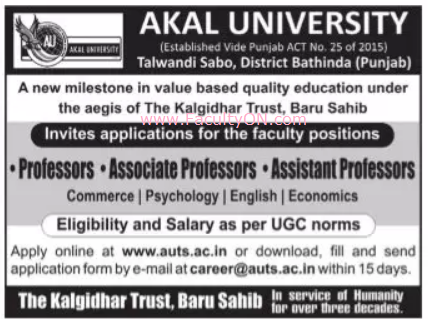 Akal University, Bathinda has advertised in TRIBUNE newspaper for recruitment of Teaching Faculty- Professor / Associate Professor / Assistant Professor jobs vacancies. Interested and eligible job aspirants are requested to apply within 15 days from 05th December 2018. Check out further more details below. About University: The University has a firm resolve to provide a drug free environment and to create a disciplined campus life. In tune with the philosophy of Kalgidhar Trust, Baru Sahib, all efforts are being made to imbibe spiritual, moral and cultural values in the students to make them decent human beings and responsible citizens. How to Apply: Interested and eligible candidates are requested to apply online or download, fill the application and send filled form to the email address provided below.